I was not aware that anyone made fruit cakes these days. My grandpa always loved fruit cake!! Wedding dress fittings!!! How wonderfully exciting. I'm intrigued by the notion of fruitcake in the freezer. Mine live in tins after they're made, snuggled up inside a blanket of brandy-soaked cheesecloth, and watered daily with spoonfuls of homemade brandy. I guess the brandy arrests anything bad from happening before they're unwrapped (in the same way freezing would). I have never heard of freezing them! My fruitcake baking day is yet to arrive. Soon, I hope! 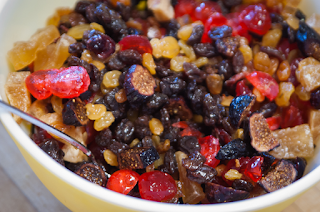 I have a wonder fruitcake recipe! I don't understand why it's so maligned. What about a recipe?I love a good fruit cake! Bella is almost a Mrs. How quickly these things happen! Gorgeous fruit mix! I just mixed up my fruitcake last week and it is in the process of aging. I would love to know which fruit you used! I think I see candied ginger? @Polly, some people who are strictly tee-total can't 'feed' the cake with alcohol and in that case the cake won't keep as long. But I agree even a fruit cake made without the alcohol should keep for a few weeks properly stored. I'm Irish and we definitely don't freeze fruit cakes either :) Is it an American thing Anna? Best wishes.